KISA publicly expresses its grave concern over the flare of nationalism among the Greek Cypriot community as well as the fact that some of the so-called ‘democratic powers’ seem to fall in line with ELAMist neo-Nazis. The excuse to behind this particular declaration lies in the recent approval in the House of Representatives of the amendment proposed by ELAM to celebrate the anniversary of the Cyprus Enosis Referendum of 1950 at schools. Aside from the consequences this decision might have on the negotiation procedure to resolve the Cyprus problem, KISA underlines that nationalism and chauvinism fuel and promote racism and place a bomb at the foundations of any and every democratic society. As in the recent past, when a window of opportunity opens regarding the resolution of the Cyprus problem, nationalism turns into a platform for all those contrary to a solution within the context based on a Bizonal Bicommunal Federation with political equality between Greek and Turkish Cypriots. Identification with and expression of nationalism inevitably leads to racism and intolerance and, by association, to racist violence and hate crimes. After all, it’s not coincidence that incidents of hate crimes by Greek Cypriot nationalists against Turkish Cypriots have increased to alarming levels recently. Attacks against Turkish Cypriots by Greek Cypriot students in November 2015, against Turkish Cypriot taxi drivers in July 2016[iii], the arson attack on Deneia mosque in February 2016 repeated attacks against Turkish Cypriots outside the APOEL building, heckling and jeering from helmet-wearing fascists against pro-peace protesters during a bicommunal event at Ledra Pallas in January 2017, as well as the recent (February 2017) malicious damage caused to Turkish Cypriots’ cars at Troodos, are only a few examples of racist violence. These are precisely the incidents that cannot be perceived as isolated but (must be seen) as consequential of an ethnocentric educational system that has existed for a very long time, and of extremely nationalist and racist public speech, which become even more intense when progress is about to be made during various attempts of resolution of the Cyprus problem. KISA rang the warning bell a long time ago regarding the increasing influence of the neo-Nazi, neo-fascist organisation ELAM. At the same time, we had expressed the immediate need for the establishment of a common code of conduct and stance of all parties against ELAM in the House of Representatives. Unfortunately, instead of this, almost all the parliamentary parties show no hesitation in “joining forces” with the neo-Nazis, ignoring the fact that this particular tactic contributes to the establishment of the neo-Nazi movement in the political life of the country and in short, legitimizes its actions in society. 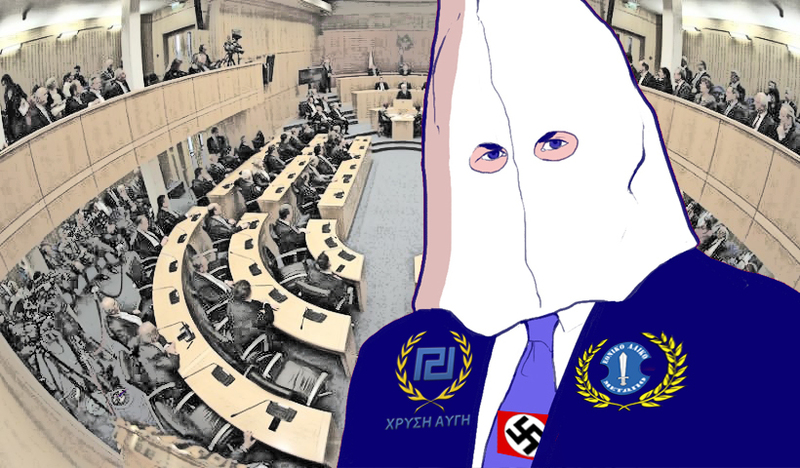 Moreover, the “legitimisation” of ELAM in parliament coincides with a period of revelations that confirm the Nazi spirit of Golden Dawn.At this point, it is important to note that Golden Dawn and ELAM are not just “sister parties” but one and the same. 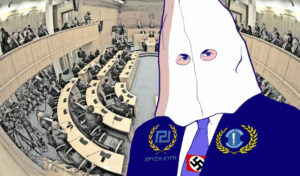 In addition to the fact that the head of ELAM, C. Christou states that “we are the Golden Dawn of Cyprus”, he himself has served as a member of the select squad of “bodyguards” (with the “red caps”) of the “Führer” of the Greek Nazis, N. Michaloliakos. Even at the last moment, the political parties to realise the dangers lurking in the political legitimization and further strengthening of ELAM and, steering clear of populism, to proceed with the establishment of a common code to deal with ELAM in the House of Representatives but also more broadly. The government to finally proceed with putting together a complete and integrated nation-wide plan of action to combat racism, nationalism and crimes committed on this basis. The immediate and effective investigation of all incidents of racist violence and hate crimes, including those committed against our Turkish Cypriot compatriots, as well as the exemplary punishment of the perpetrators.